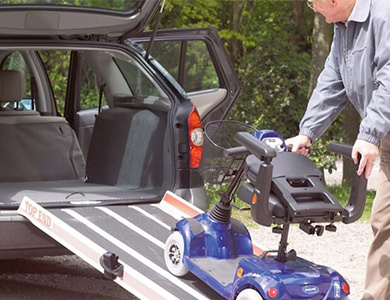 Invacare Portable Ramps are manufactured with a unique combination of uni-directional glass and carbon fibre materials to create an extremely strong and lightweight ramp suitable for a wide range of uses. Tested to AS/NZ Standards, up to 300kg*, Invacare Portable Ramps can be deployed in seconds, requiring no assembly and is immediately ready for use. Click on the lifestyle image or product name below for a description of each portable ramp.